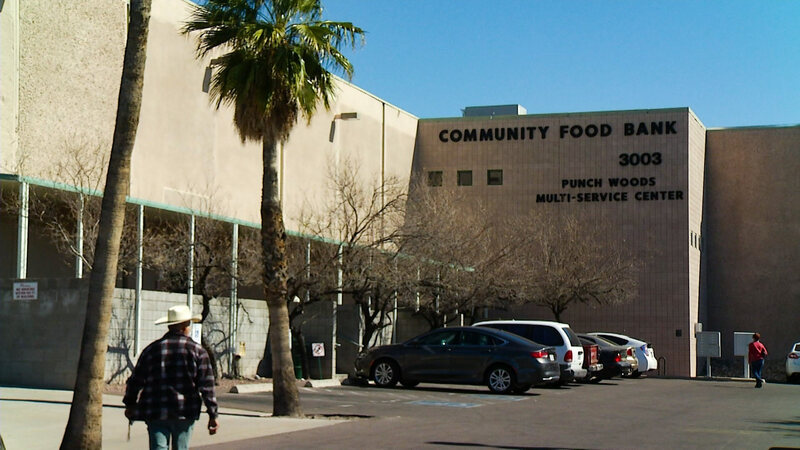 The main branch of the Community Food Bank of Southern Arizona. The Community Food Bank of Southern Arizona is receiving 5 million pounds of additional food thanks to the trade war. The U.S. Dept. of Agriculture is buying food that is considered "unfairly targeted" in trade disputes and giving it to food banks. "You don't expect a trade dispute, trade war to benefit a local community, but the USDA is buying up a lot of food stuff that we don't often see in Arizona, including blueberries and walnuts and wonderful apples, pork, we are hoping for some fresh milk," said Michael McDonald, CEO of the Community Food Bank of Southern Arizona. The food is expected to begin arriving within the next two weeks. Since most of it is perishable, the food bank is dipping into reserves to find additional cold storage space to keep the food fresh as it is being distributed. Food bank officials said they will need cash and volunteers to get the food distributed quickly. Last year, the food bank distributed 71 million pounds of food across Southern Arizona. This latest infusion of food from the USDA is a 60 percent increase over what the federal government normally gives to the facility.